It's been a while since we've heard some new Halsey material, hasn't it? And no, we're not including The Chainsmokers' "Closer" by the way... we're talking about the real dark and twisty classic Halsey bops that we've become accustomed to. Queen Halsey been teasing new music since she closed out her Badlands tour at NYC's Madison Square Garden earlier in the year. In fact, after a quick sleuth, it turned out that she had been dropping hints about her second album for well over two years and no one even noticed! This past week, Halsey has been slowly but surely revealing little snippets and nuggets of info to her fans and everyone is getting hyped about a brand new album that could be MONTHS away from release. After updating her Snapchat with some studio sneak peaks, she shared her progress on Twitter. On Nov 2, she tweeted and deleted a comment about new songs for the next album. 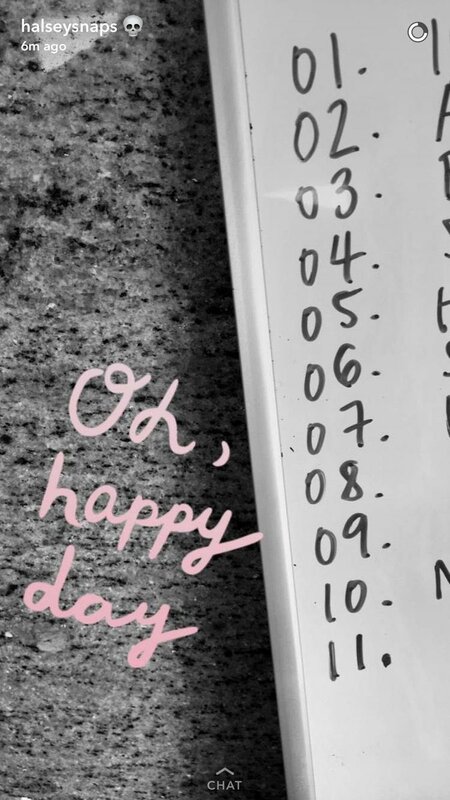 And a few days later, she treated her Snapchat followers to sneak peak at the track list to her new album too. So, what is the album's concept gonna be? Speaking to MTV news back in 2015, she revealed that she had already laid out the entire concept for the follow ups to her first EP and Badlands album: "It started in Room 93 with the EP and moved to Badlands with the album kind of taking you to the world that existed outside the 93, and so my plans for the second record is to take you to the universe outside of the Badlands, so widening the zoom on everything little by little as the records go on." And the next phase of the zoom? We're going to the Kingdom. So strap yourself in for Halsey's next masterpiece coming sometime in 2017, we'll update you when we hear anymore bits of info... if we haven't already died of excitement that is! QUIZ: Which Halsey Song Sums Up Your Entire Life?